As humans continue to live longer, certain diseases start to become more apparent, causing widespread concern for the elderly and their families. One of them is Alzheimer’s disease (AD) – a horrific disease that starts off with short-term memory loss and gradually progresses to severe memory failure including forgetting your own children and family. Chances are that a large percentage of people reading this article have either themselves been affected by AD or have seen a close relative suffer from its effects. The number of AD sufferers is expected to double every 20 years and by 2050, the world is expected to have 132 million AD sufferers. AD’s cause and development is still not well understood, and the current batch of treatments remains woefully inadequate in treating symptoms or reversing the disease – a better solution is desperately needed. Aside from the health issues for patients and impact on their families, this could cost the global economy in excess of $2 trillion per year in healthcare costs. The majority of this cost will be felt by governments and taxpayers – which is worrying in itself considering Western government budgets are already underfunded. ...and we think we’ve found an ASX-listed company that has a great shot at achieving such a difference. This difference has everything to do with ‘cortisol’ (a naturally produced steroid hormone) and this company has already seen very pleasing positive animal trial results following 10 years of research at the University of Edinburgh in Scotland. This company is in fact, at a similar stage to one peer that was recently involved in a $3.5BN buy-out after completing its Phase II trials. Fully funded Phase II trials kicked off in March this year – and we should start to see significant newsflow start to trickle through in the coming weeks – providing imminent catalysts for this stock. Remember that today’s company is still an early stage play and caution is advised when considering this stock for your portfolio. $3.5 billion was the sum paid by big pharma company Otsuka to buy Avanir Pharmaceuticals – which had successfully completed Phase II trials on another drug treating AD. Could this ASX listed stock start to receive similar takeover offers following its Phase II trials – or even in the lead-up to the completion of the trial? If this company can progress its research as it would like, we could see its technology adopted by clinicians the world over and better yet, be used to treat other cortisol-related ailments such as diabetes, Parkinson’s Disease and dementia. Leading this company’s charge is Dr Bill Ketelbey, a former Pfizer VP who was instrumental in helping the multi-billion pharma giant develop and commercialise the current market-leading multi-billion dollar drug – Aricept. We’re in full support of the work this company is doing and hope that it can succeed in its mission not just for commercial reasons, but also because it would mean millions of our much wiser elders can rediscover a higher quality of life. Regulatory approval for the company’s Phase II trials is expected soon from the US Food and Drug Administration (FDA), the UK’s Medicines & Healthcare Regulatory Agency (MHRA) and Australia’s Therapeutic Goods Administration (TGA) – meaning steady news flow over the coming months. This will culminate in the selection of research sites and patient recruitment... meaning steady newsflow over the coming months from this stock. 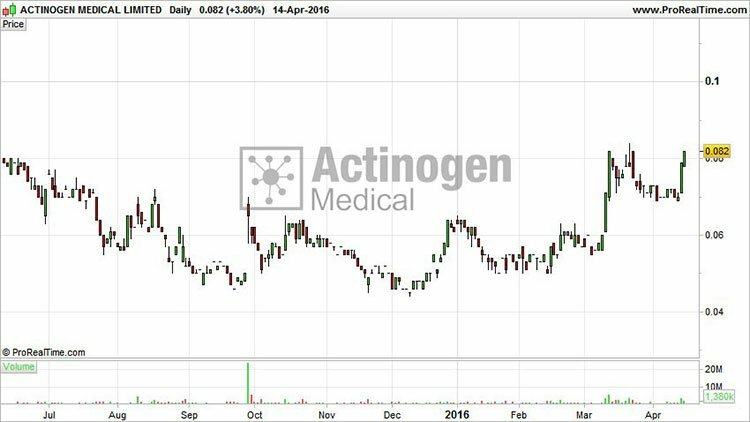 Actinogen Medical (ASX:ACW) began its mission to put a dent in AD around 18 months ago when it acquired the rights to a drug compound XanamemTM from the University of Edinburgh. The University’s endocrinology department had been working on Xanamem for over 10 years and spent over $25MN on development. When they ran into trouble advancing this drug because of depleted grant funding (not through any lack of the drug’s potential), the University decided to sell the rights to ACW. The Xanamem acquisition put ACW on a playing field that includes it amongst big pharma heavyweights such as Pfizer, who are also developing AD drugs, but of a rather different variety that do not target cortisol. With the sheer size of the addressable market, the large unmet patient need for a solution to Alzheimer’s Disease, and patent expiries looming for existing treatments, up and coming small cap companies with a novel solution like ACW may well be on Big Pharma’s radar for an acquisition or joint venture. ACW remains a small-cap stock capped at just under AU$50MN. This means there’s plenty of room for growth, especially if the big pharma juggernauts come sniffing around, as ACW approaches the end of Phase II and starts eyeing up Phase 3 trials. Could we being seeing this stock’s bottom around the $0.04 mark and generate further upside as its story gains traction? According to research from Baker Young, this is a tangible possibility. At the same time, analyst price targets are no guarantee of being realised and are based on a number of assumptions that may not happen. So don’t just invest on price targets like this alone. In the research report , the analysts also say that ACW’s Phase II results “will likely generate substantial investment or acquisition interest from major industry players”. That is synchronistic with our own view that ACW’s Xanamem could be a golden goose. Xanamem works in a completely different way to existing AD treatments, or those in research. 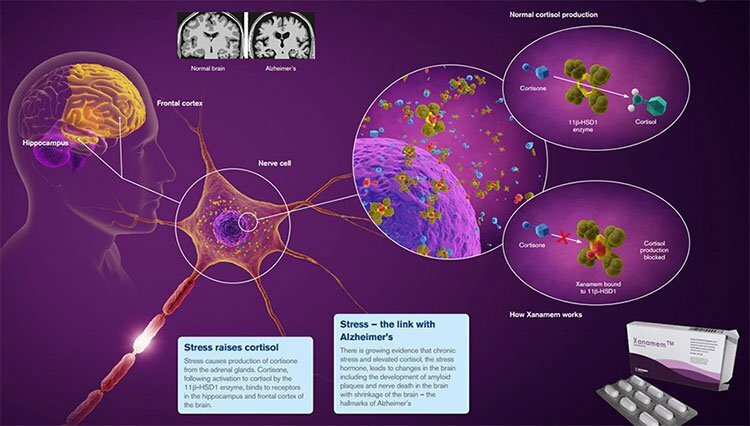 By targeting the enzyme that produces cortisol – the ‘stress hormone’ – it is hoped that Xanamem can slow down or even prevent the onset of AD by removing one of its key causal factors. Excess cortisol has consistently been shown to be associated with memory loss, amyloid plaques and neurodegeneration – the classic hallmarks of AD. 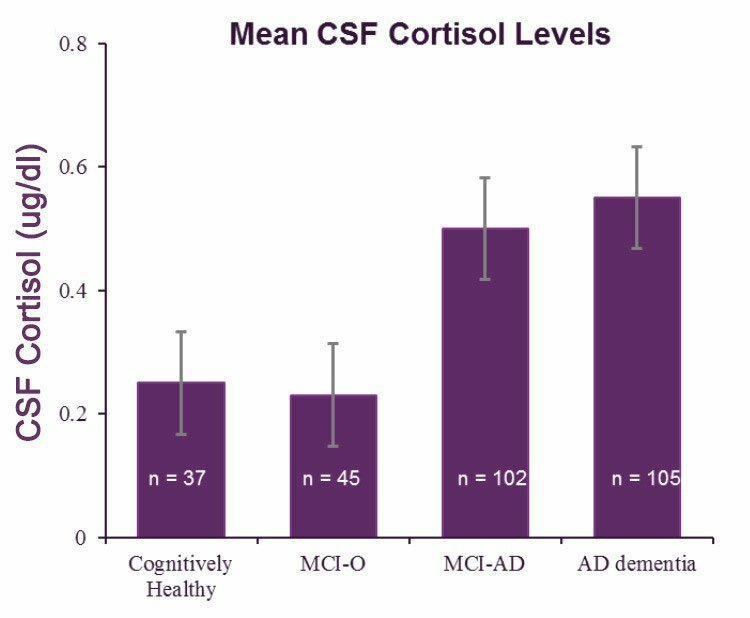 Here’s further research conducted by ACW, again showing an inverse relationship between cortisol levels and cognitive health. These early stage results raise hopes of ACW’s Xanamem being able to demonstrate efficacy and attract big pharma. Or at least attract a larger development partner. 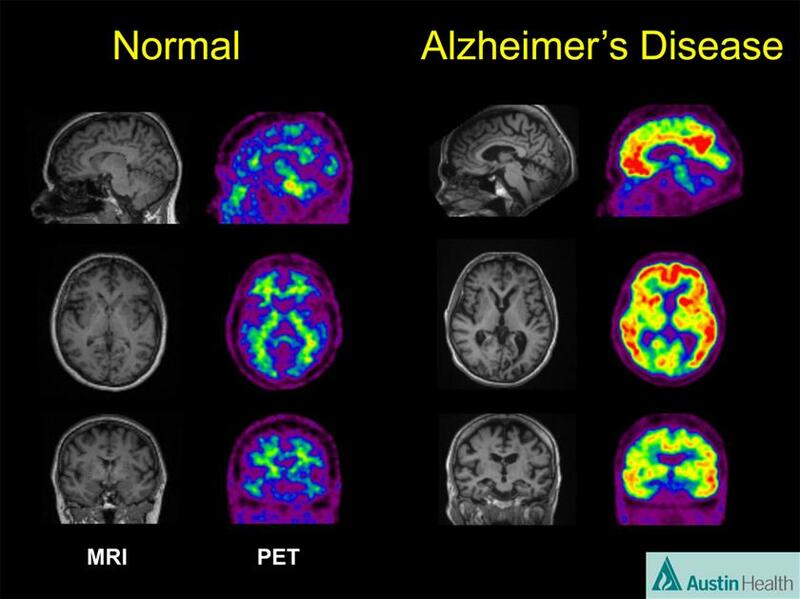 In effect, Alzheimer’s is a progressive degeneration of the brain that has no cure. Below is a graphic illustrating the gradual decline that takes anywhere between 5-15 years. With ACW’s Xanamem being an early stage drug that has only just begun human efficacy trials, the only efficacy data currently available is from animal testing. Animal testing undertaken so far showed that cognitive abilities markedly improved in rodents that were given Xanamem, compared to those that were not. The following graphic illustrates the cognitive enhancement after Xanamen was applied to rodents – and this significant improvement in cognition was achieved after only 28 days of treatment. This passive avoidance test found that mice with normal learning and memory will avoid entering the chamber where they had previously been exposed to shock. Despite its early-stage status, ACW published clinical trial results last year which adds confidence for Phase II. With Phase I completed in August , ACW has quickly moved to initiate Phase II. The next stage for ACW’s Xanamem is Phase II trials that commenced in March 2016. The good news for ACW investors is that the study is now fully funded after a strong $11MN capital raising last year . Here’s a quick snapshot of what the Phase II trial entails. Phase II will probably take only 2 years to fully complete, but the wait could be more than worth it. That’s because Xanamem’s approach to treating AD symptoms is completely different to any other method. If proven in clinical trials, ACW’s Xanamem will be the world’s first drug that inhibits cortisol that has been shown to have an impact on both AD symptoms and the underlying disease. If ACW can demonstrate this dual action it would greatly enhance their value proposition if proven under scientific conditions. Any enhancement of value proposition is currently speculative, so caution should be advised when considering this stock for your portfolio. A value inncrease is not so far-fetched when you consider the volume of publications confirming the link between cortisol and AD. One thing we like to see when screening a stock is that sturdy management is in place with the know-how required to grow the business. At ACW this aspect is being taken care of by Dr. Bill Ketelbey, a successful pharma veteran with over 30 years’ experience. Dr. Ketelbey has an exemplary track record of product development over his years in the industry leading to the successful development, registration, and commercialisation of numerous market leading medicines in a broad range of therapeutic areas. ACW’s CEO and Managing Director has served in Senior Management roles at Pfizer, helping the multibillion dollar juggernaut to develop Aricept, the current market leading drug treating AD. Left to right: Prof. Craig Ritchie, Prof Brian Walker, Prof. Colin Master, Martin Rogers, Dr. Bill Ketelbey, Vincent Ruffles, Dr. Scott Webster and Prof. Jonathan Seckl. Aricept (and its generic donepezil) currently generate sales of several billion dollars per year. Having a strong Management team including an ex-Pfizer pharma veteran to shepherd ACW through Phase II trials is very positive. Dr. Ketelbey knows developmental research and the lay of the regulatory land having taken Aricept through Phase 3 trials with Pfizer. Who knows, maybe some of his pharma brethren will come knocking on his door if he can progress Xanamem through Phase II with ACW? ACW’s other notable advantage is having strong connections to the University of Edinburgh via its Advisory Board. This partnership and collaborative development should ease the development path for Xanamem and brings ACW closer to those all-important joint-venture offers down the track. Let’s take a macro look at the fight ACW has taken up against Alzheimer’s disease. AD has no cure with the eventual onset of organ failure and death. 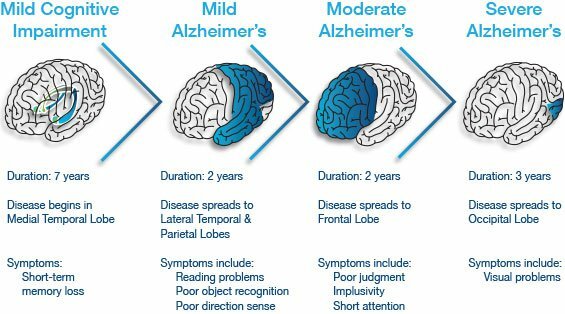 Currently, the typical life expectancy after an Alzheimer’s diagnosis is 4-8 years. AD sufferers and their kin often say that AD is worse than death because of what the disease takes away: dignity and grace – two things that you will often hear people say are more important than staying alive. Despite affecting mainly people over the age of 65, AD is becoming a huge burden for all countries and especially for those with ageing populations such as the US, Europe, Japan and Australia. The demographic trends are escalating the prevalence of AD with existing healthcare costs already reaching as high as $250BN globally. An estimated 5.4 million Americans currently are living with Alzheimer’s disease. Worldwide, that number rises to nearly 44 million people. One frightening statistic is that only 1-in-4 people with AD have been diagnosed which means there could be as many as 120 million people suffering from AD, and don’t even know it. In the US, total payments for the care of people with Alzheimer’s and other dementias are projected to be $236 billion in 2016, of which nearly 70% will be paid by Medicare/Medicaid. Outside the US, the same principle applies with national budgets having to pick up the bill. The sad reality is that the net spend to fight and contain Alzheimer’s will likely balloon to over $1 Trillion over the coming years, partly due to more cases being diagnosed but also because of recent US healthcare reform that has put a greater burden on US public healthcare. Government budgets are swamped as it is, so any increase in healthcare spending will only pile more pressure on creaking healthcare systems, especially in poorer countries. By 2050, as many as 16 million Americans will have Alzheimer’s disease. Unless prevention therapy or actual treatment is developed in the coming decades, total costs of care could reach an estimated $1.1 trillion in 2050 as 10 million new cases are diagnosed each year. That’s one person every three seconds. This huge exacerbation over the past 10 years is due to the ageing population and demographic trends are contributing to increasing the amount of AD sufferers. For ACW it represents a growing market while its product could potentially stand out as a silver bullet that treats AD symptoms and attacks the underlying disease. In terms of blue-sky potential, ACW could be trying to emulate an Alzheimer’s deal struck around 18 months ago. In late 2014, Otsuka bought out Avanir Pharmaceuticals in a US$3.5BN deal after Avanir had just completed Phase II trials of its drug treating Alzheimer’s. Here at The Next Biotech , we think ACW has a great chance of picking up more than just a few speculative offers as long as it can prove up solid clinical data as part of its Phase II Xanamem trials. However this is no guarantee – ACW is a speculative biotech stock, and caution should be applied if considering making an investment. As any pharmaceuticals investor should know – developing a new drug always means lengthy research and development schedules and ample funding requirements. ...and there’s plenty of imminent catalysts to potentially push this stock to higher levels. Remember, over the coming 3 months ACW is likely to receive regulatory approval from the US Food and Drug Administration (FDA), the UK’s Medicines & Healthcare Regulatory Agency (MHRA) and Australia’s Therapeutic Goods Administration (TGA) to commence its Phase II clinical trial programme. And, then of course, the first patients will go on the trial. ACW is also likely to publish detailed Phase 1 results later this year. As long as results continue to show Xanamem’s cortisol-focused concept working, it could be huge boon for ACW. AD is ravaging modern society as life expectancy rises and people live longer. The disease is still not well understood and the current batch of treatments remains woefully inadequate in treating symptoms or reversing the disease. So as the number of AD patients doubles every 20 years and healthcare costs rise exponentially given the nature of care required, a huge business opportunity has presented itself for ACW. ...therefore regulating its effect on the body will be effective in treating them. Early results on animals and preliminary human safety trials have been passed with flying colours as ACW’s Management team have progressed Xanamem over the past year. Xanamem is designed to be an Alzheimer’s drug, but in the end, could potentially become so much more due to the underlying methodology of how it treats cognitive dysfunction. Its ability to restrict cortisol production in the body can be used in a variety of treatments and in combination with other drugs already being used to treat AD and other cognitive dysfunctions. ACW has successfully completed all the necessary early phase studies to confirm that Xanamem is well tolerated with an acceptable safety profile. 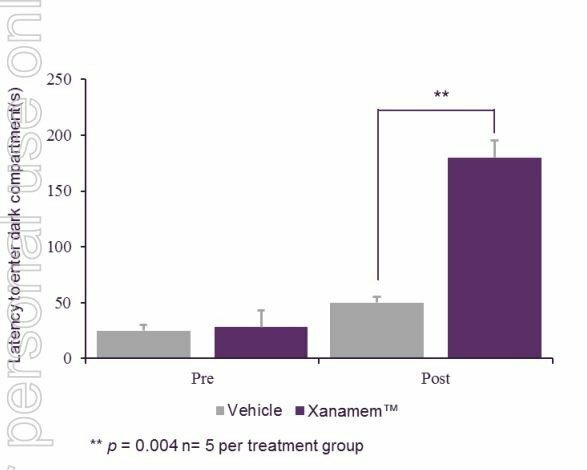 Results also show that Xanamem is able to cross the blood-brain-barrier in sufficient concentrations to inhibit cortisol production. 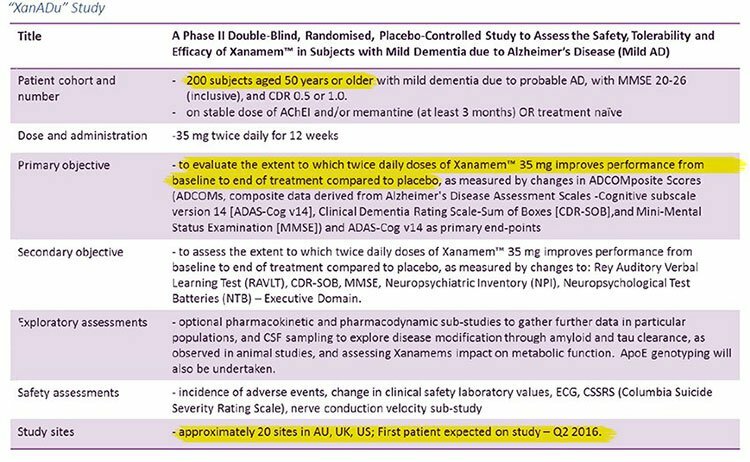 With fully funded Phase II trials now ongoing we could be hearing a lot more about Xanamem as long as final results corroborate ACW’s earlier research. The fight against Alzheimer’s may just have turned the corner, and we’ll be keeping a track of how this fight develops.